Pawan Hans Limited invites applications for the posts of Demonstrators, Instructors of 16 vacancies on its official website pawanhans.co.in. 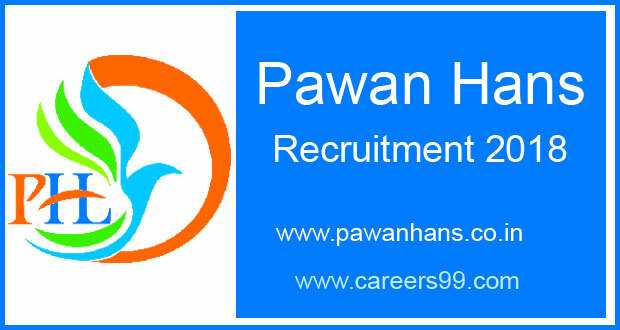 The details of Pawan Hans Limited Notification 2018 are available at www.careers99.com also. Interested and eligible candidates can Apply Online before the last date of the Notification i.e., 15-03-2018. Education qualifications, age limit, selection process and other details are as follows.. Interested candidates those want to apply for Pawan Hans Limited Demonstrators, Instructors posts must having following educational qualifications. Basic AME Licence (BAMEL) in relevant category or Degree in Engineering in Aeronautical / Mechanical / Electrical / Electronics / Instruments Engineering with one year post qualification practical / instructional experience in aviation industry. Diploma in any of the above disciplines or Bachelor of Science in Physics, Chemistry & Mathematics / Bachelor of Science (Electronics) with three years post qualification practical/instructional experience in aviation industry. Diploma in any of the above disciplines with one year practical/instructional experience in aviation industry. Eligible Interested candidates are required to apply online through Pawan Hans Website. Applications complete in all respects duly superscribing the envelope with the post applied for must reach to “Joint General Manager (HR), Pawan Hans Limited, (A Government of India Enterprise), Corporate Office, C-14, Sector-1, Noida – 201 301, (U.P. )” on or before 15/03/2018. First of all, Open Official Website i.e., pawanhans.co.in or Below Mentioned link from www.careers99.com Website.